What a way to kick start 2015! Geeta Ashram Youth was invited to have their own booth at this year’s Muhibah Walk on 18.01.2015. What is the Muhibah Walk? It is a walk to unite Malaysians while celebrating our cultural, ethnic and religious diversity. The event was organised by The Movement and Vision 2 Transform, with the aim of the event being to promote Malaysia’s vision of becoming a harmonious and united society. With all the booths being set up and the event about to begin, no one could have predicted the huge downpour of rain that followed. The rain lasted for what seemed like forever and spirits seemed to be dampening (literally and figuratively). But did it actually dampen our spirits? No! 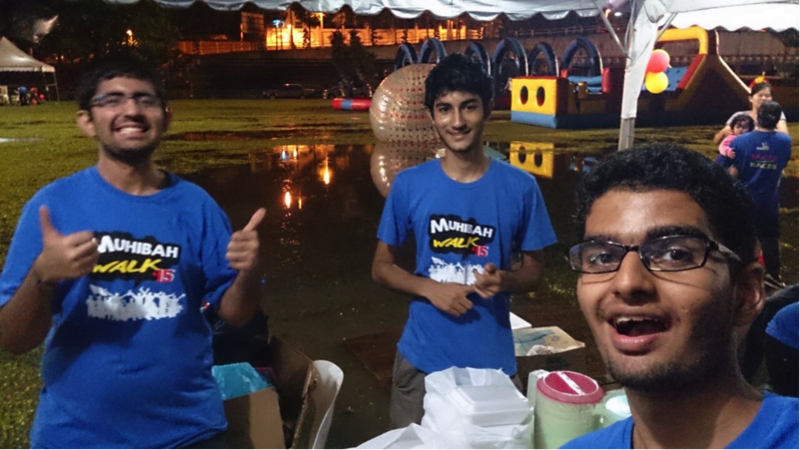 Those where the thoughts of our event organisers, who successfully started the walk in the rain! We were there to celebrate the unity in our diversity and the rain wasn’t enough to stop us. Those who decided to participate in the event were greeted by the Geeta Ashram Youth booth with warm, delicious and authentic vegetarian Nasi Lemak to fill their stomachs. There was Milo and flavoured homemade Lassi (I kid you not, they are the best Lassis you will ever get to taste) to quench their thirst. In addition, we offered a selection of trinkets and second hand books that had all sorts of titles (from “How to Study Effectively” to romantic novels to “How to Train your Dog”). Do look out for more activities by GA Youth this year! We look forward to having you join us! Congratulations and best wishes to ga youth for participating in muhibah walk and raising funds for the ashram. May Lord Krishna bless all of you for your selfless service!